SICCI Chief Executive Officer Jerry Tengemoana will be speaking at today’s talks on the business environment and opportunities and says the current mission sets the scene for PNG’s already-existing dominance of trade and commerce entry points to continue. 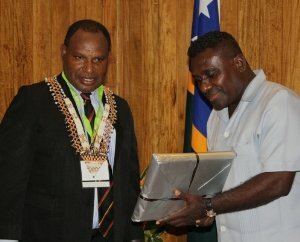 A high-powered Papua New delegation of almost 100 officials and delegates led by PNG’s Trade, Commerce and Industry Minister Richard Maru arrived Honiara yesterday for a four-day program. Maru will be keynote speaker at a breakfast welcome featuring his Solomon Islands counterpart, Elijah Muala, at the Heritage Park Hotel this morning. “The opportunity to work with Papua New Guinea’s Investment Promotion Authority who are spearheading this initiative marks a relationship we intend to build on for future growth,” says Tengemoana.